This article is about the race course from Mario Kart 8 and Mario Kart 8 Deluxe. For other race tracks with similar names, see Mario Circuit. The Mario Kart 8 incarnation of Mario Circuit appears as the first course of the Flower Cup. This Mario Circuit's layout is designed after the Möbius strip (a closed surface consisting of only one side) to make full use of the new anti gravity aspect of the game. It is placed around Peach's Castle which happens to be on floating islands. Like the Figure-8 Circuit and Toad's Turnpike, the track is shaped like the number eight. There are Goomba Towers near the finish line that can spin out the player. The track is lush and green, surrounded by the blue sky and white clouds, as well as waterfalls below. There are twenty-two Coins located on this track. In Mario Kart 8, it is a selectable battle course. Being designed after a Möbius strip, the track follows a single path that twists around near the beginning. The track remains fairly simple in terms of design. Players start on the straightaway of the Möbius strip and shortly after, there is a turn to the left. A white bridge is a short ways away of the turn which starts the Anti gravity section. The track turns to the right shortly after and start racing underneath the finish line. After a left turn, the racers cross the white bridge, which twists the track back to normal and after another right turn, the racers approach the finish line. A gliding ramp and Goomba Towers appear at the stretch to the finish. The staff ghost for this track is Mario on the Standard Kart, with Normal tires and the Super Glider, with a time of 2:07.436. In Mario Kart 8 Deluxe 200cc, the staff ghost is Pink Gold Peach with a time of 1:23.243. 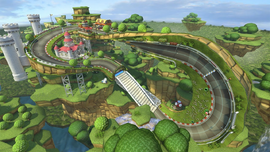 The track appears in Super Smash Bros. for Wii U as a new stage. The stage has been shown to take place on several platforms that move around the stage, stopping at certain intervals around the stage similar to Rainbow Road in the 3DS version. Shy Guys can drive into the fight like in the aforementioned stage and the other Mario Circuit stage, however because of the anti-gravity element they can drive on other surfaces such as on the wall to the right of the players or from the background albeit upside-down. The default music is a medley of the Circuit theme and Neo Bowser City's music from Mario Kart 7, though the original versions of numerous songs from Mario Kart 8 including Mario Circuit are also available. Mario Circuit returns as a playable stage in Super Smash Bros. Ultimate. This is one of the three Flower Cup courses in Mario Kart 8 to be playable in the E3 2013 demo, the other two being Toad Harbor and Twisted Mansion. On a side note, all three take place in the Flower Cup, and are in the same order as they were in the demo. This track is one of three courses where the starting banner can be interacted with from playable characters via hang-glider. The other two courses are DS Wario Stadium and 3DS Neo Bowser City. It is also the only one of these three courses that is a Nitro Course. This track's theme contains a part from Mario Kart Stadium's music. Mario's Standard Kart can be seen in the pit area, alongside ? Blocks. This page was last edited on December 29, 2018, at 19:23.